Beat pudding mix, milk and extract with whisk 2 min. 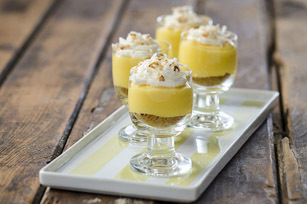 Spoon graham crumbs into 4 small glasses or bowls; cover with a layer of pudding and Cool Whip. Refrigerate 2 hours. Top with coconut just before serving. Desserts can be refrigerated up to 24 hours before serving. These creamy desserts, made with better-for-you products, can be part of a healthy eating plan.